Portuguese Tile Quilt | OccasionalPiece--Quilt! 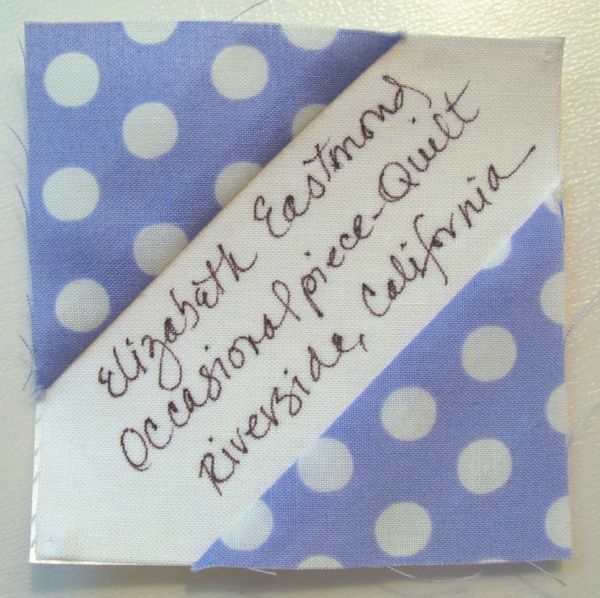 Posted on February 15, 2013 by Elizabeth E.
I finished sewing this together during the last Downton Abbey. I love it. But now what do I do with this? Moving on. . .
Cindy, of Live A Colorful Life, asked us to make this block from During Quiet Time’s tutorial for her turn in our MidCentury Modern Bee. Today, after taking a nap (really, I just couldn’t go any further and I have a life where I can take a nap if I want–that’s why I am in the Mid-Century Modern group, as all of us are over the mid-century mark on the old birthday calendar), I plowed into it. The tutorial is very clear and easy, and it was fun to draw from my stash. Signature Block for February’s block. We are each including one of these smaller blocks along with our square. 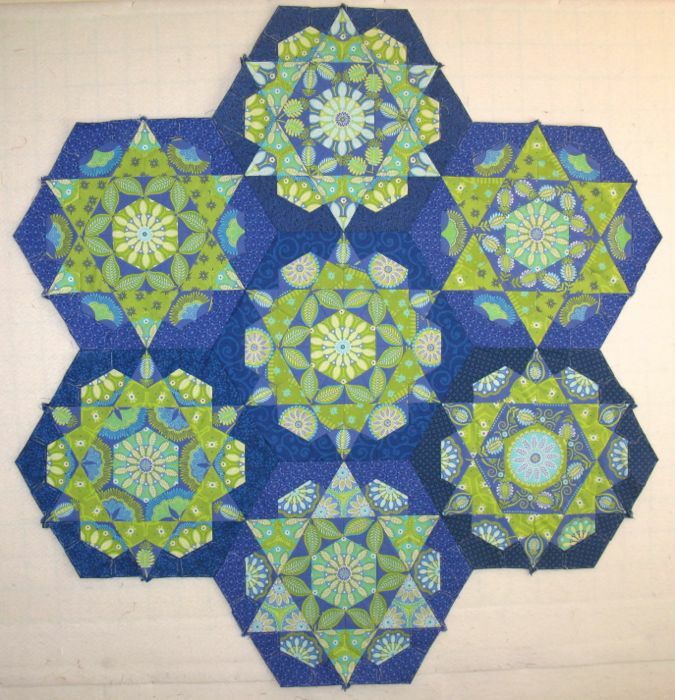 Tutorial is from PS I Quilt, but I won’t call it a “siggy” block, for the same reason I avoid the word “veggie” (instead vegetable). This Churn Dash was made for Carla of Lollyquiltz, by following her tutorial. 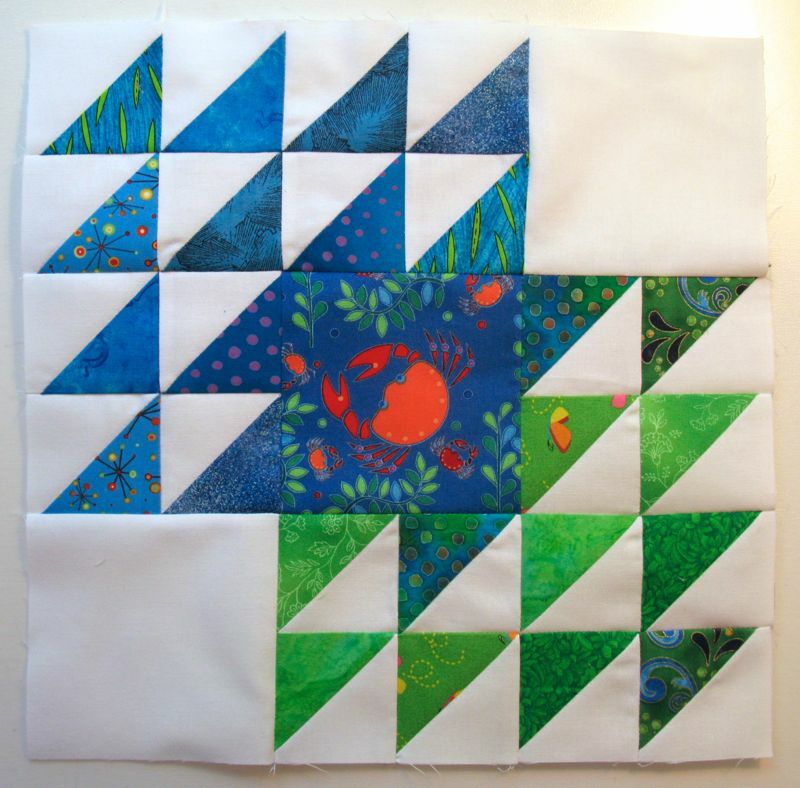 She uses the two squares-sew the edges method of the half-square triangle. 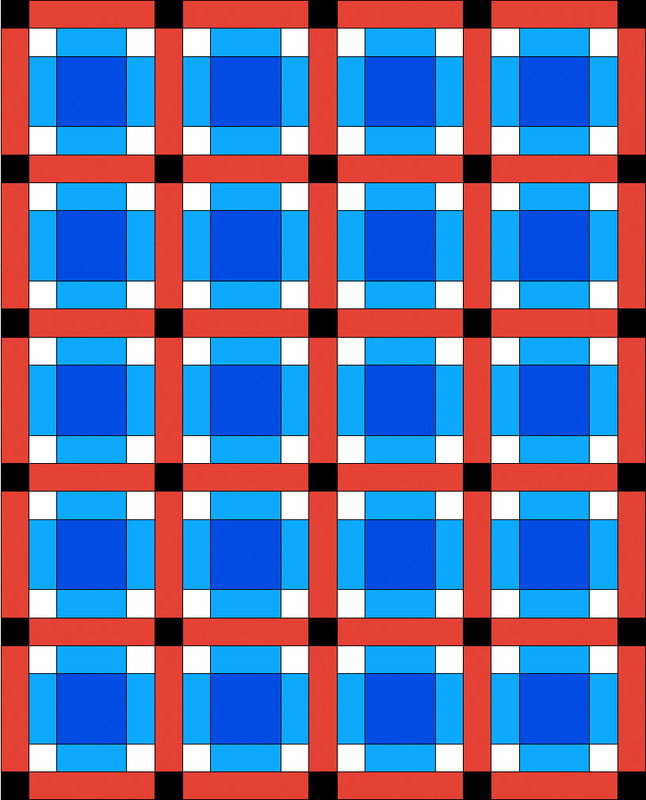 I found it easy, but did think that the block was a little more fluid because of all the bias edges. 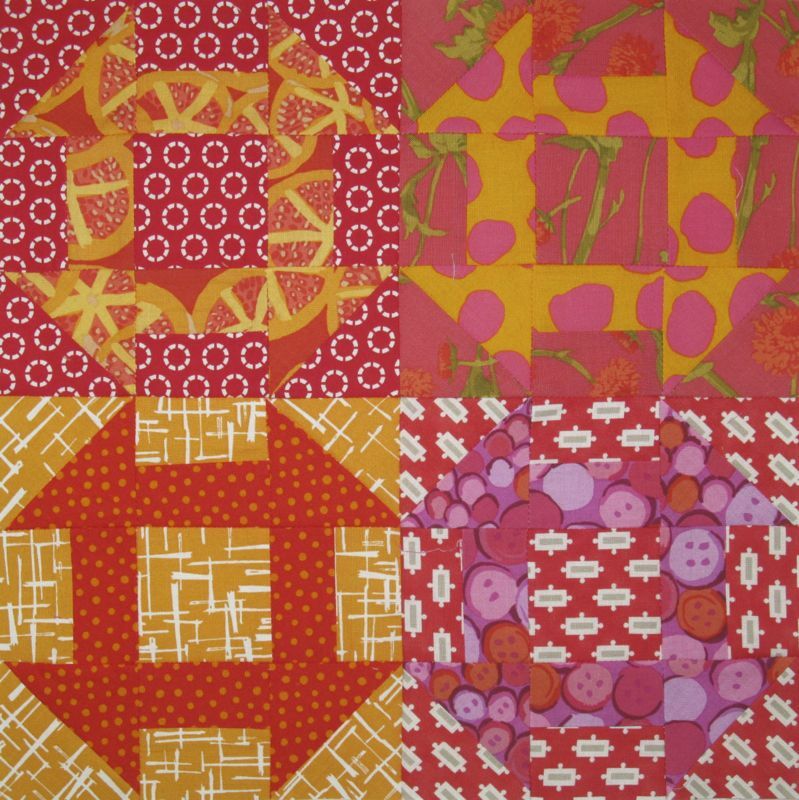 She calls this block Juicy Fruit, and her quilt is something to behold (click on the link to go to her Flickr photo pool). 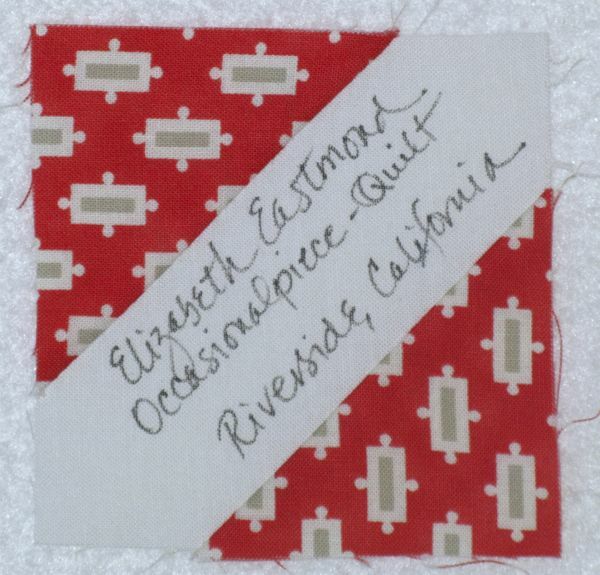 And this was her signature block–requested in colors from her quilt. I ironed freezer paper to the back of the white section to get it stable enough to write on. Okay, that’s where I’m at so far this month, but the really exciting thing was hearing from Betty just before I left last week. 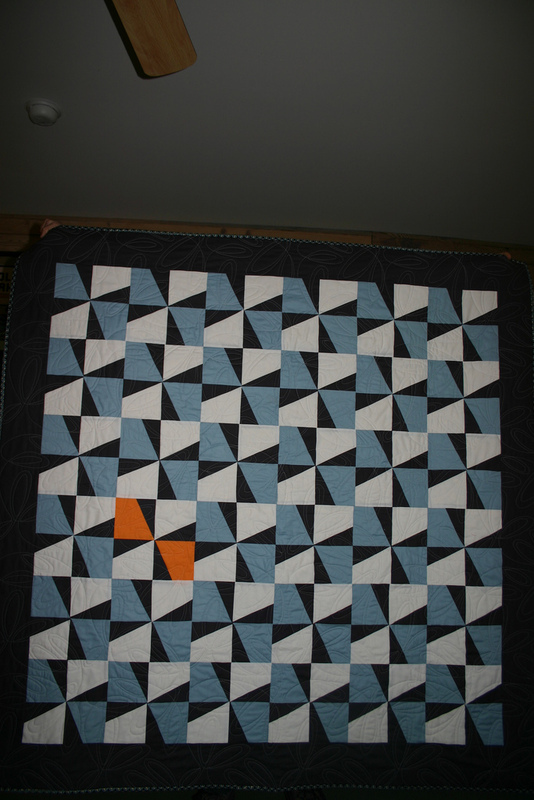 She’d made up my Harvesting the Wind in her own colors and had just gotten it back from the quilters. She gave me permission to put up photos on my blog. So. . . here they are! She used all solids, but added that pop of tangerine to really set off the tile block. I was smiling and grinning from ear to ear, because I loved seeing what she’d done! Betty, it’s wonderful. She’s one of the Four-in-Art members, so it’s fun to have another connection with her. 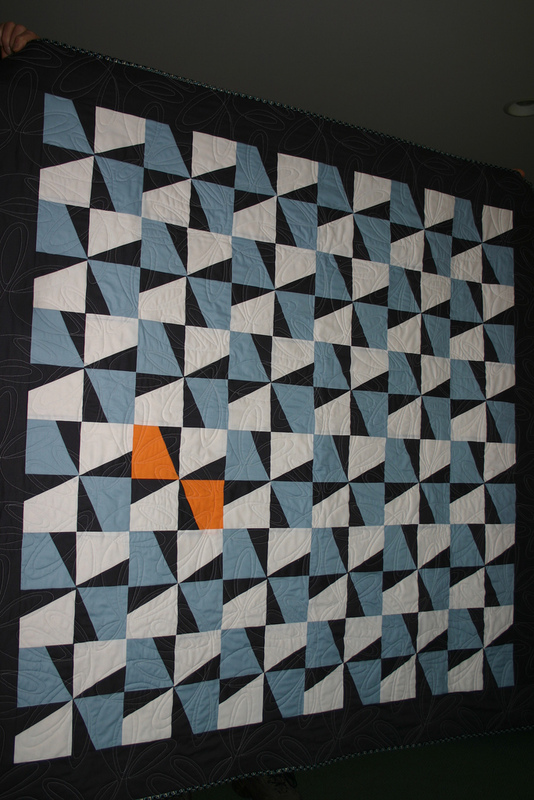 I think we are Quilting Twins in some ways, and I keep trying to figure out a way to get to the East Coast to meet her. Okay, not done yet. I mentioned I wanted to make the Sunshine and Shadow in another colorway, this time for my grandson. 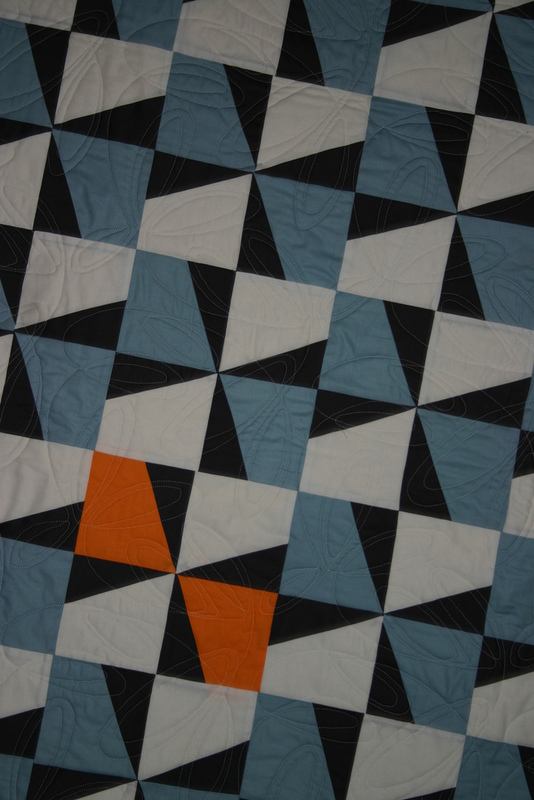 Here’s the initial mock-up for the quilt. It looks really different in such bold “boy” colors (he likes blue, red and black but I couldn’t resist lightening it up with those white patches), but I know it will go together quickly. Have a nice Presidents Day Weekend!